Skin tags, unsightly bits of skin that form in skin folds and creases, typically range from 1 to 5 mm in length. They generally form under the arms and around the neck and groin. Exactly what prompts skin tag growth is unknown, but chafing or irritation, hormonal variations and insulin resistance seem to be factors, notes the New Zealand Dermatological Society. Skin tags usually grow in greater numbers on obese people or those with type 2 diabetes. For safety reasons, a skin tag on an eyelid or extremely close to the eye should be removed by a medical professional. However, skin tag removal at home can be safely performed on tags in other areas close to the eye. Purchase a pair of sturdy, entirely metal scissors. Opt for a pair sealed in a package. Clean your hands and the scissors with antibacterial soap and lukewarm water. Wash the soap off the scissors completely and submerge them fully in a pan of water. Cover the pan and bring the water to a rolling boil. Wait 15 minutes, which is the necessary time for sterilization of the scissors, says the Ohio State University Medical Center. Remove the pan from the heat source once the time has passed. Leave the scissors in the water. Cleanse the skin tag and skin in the immediate vicinity of the growth with antibacterial soap and lukewarm water. Be careful to avoid getting soap in your eye. Dry the skin with a clean towel. Close your eye tightly, and cautiously dab a bit of rubbing alcohol onto the skin tag and surrounding skin, using a small piece of gauze. Remove the scissors from the pan by the handles, without touching the sterilized blades, once you are certain they've cooled enough to touch. Pinch the end of the skin tag firmly with your non-dominant hand and stretch it out as much as possible. Part the scissor blades and aim them away from your eye, and slide them over the base of the skin tag. 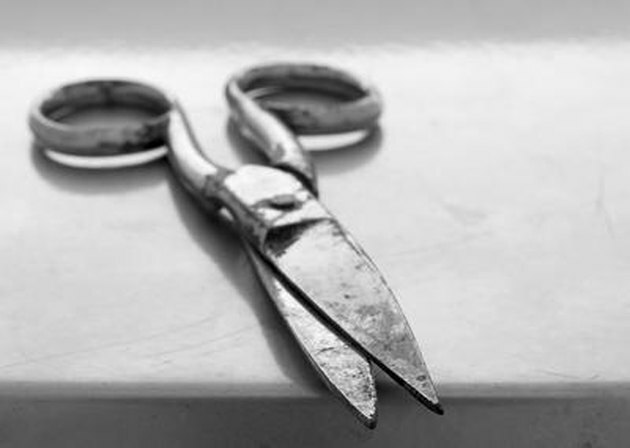 Snip as close to the skin as possible, using the area of the blades closer to the handles, rather than the tip of the scissors. Hold a piece of gauze to the area with firm pressure to stop any bleeding. Close your eye tightly, rub a small amount of topical antibiotic to the area and cover it with a small adhesive bandage to minimize the risk of infection, suggests The Merck Manuals Online Medical Library. Check the area for signs of infection, such as redness, swelling or discharge, over the next few days. See your doctor if you suspect infection.